I recently have been working on a pvp game where the last person alive wins. The problem is, I don't know how I would detect the last player alive. I was thinking I could do it with a scoreboard but I don't know how I would do that. What would be the best way to do it? I've used this system every time I make a pvp map, and it works. It's really easy as well! The following must run in numerical order on a clock. 1. Grab the number of players that are alive. 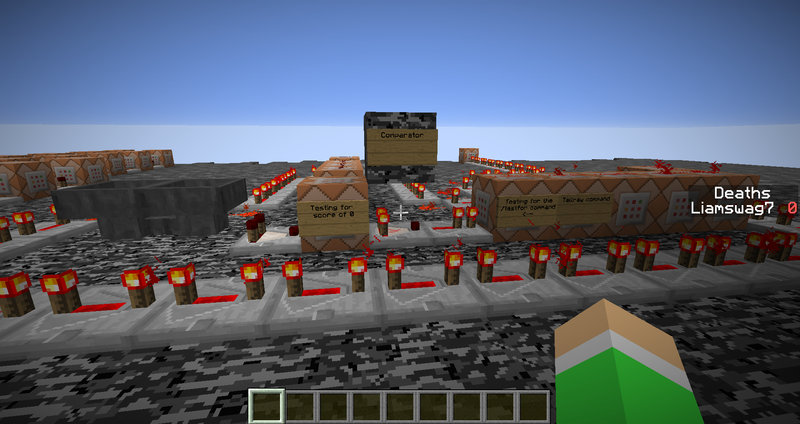 This is a simple /testfor; the "SuccessCount" tag of the command block will be set equal to that number of players. No need to use any extra scoreboards as a result. 2. Check if the /testfor command only returned a value of 1. Change the XYZ coordinates to point to the previous command block. 3. Conditional. If the /testforblock command succeeded, then only 1 player is left alive. You can run commands from here to indicate the end of the game. Oh my gosh thank you so much! I believe I have read one of your posts about the tell raw commands before. Hey, do you know how I would add color to that tell raw command you put? I tried it myself but the formatting is way different from what I do. And also, how would it detect a winner if all players had died multiple times? Would I have to make it so that whoever has the least amount of deaths would win? Like, whoever has 1 less? This also works with the "title" command. Is the game time-based or is there a maximum number of times a player can die before being considered "out of the game"? If a player dies then they're done playing the game. If a player has not died at all, they would be the winner; if they died even once, regardless of multiple times, they simply cannot win. For example, if it was the third time they had played and there were 4 players. Their scores were 4 4 4 3. How would it continuously check for a winner if it's set to look for a score of 0? You'll want to create a secondary objective that will have its score reset to 0, because trying to check from a total number of deaths will not be accurate. If a player died a lot compared to others, but won the next round, they won't be seen as a winner because there would be others with lower deaths. You can track multiple objectives with the same objective-type if you want to track both the total and for the current game. That will work, but how do I reset there scores back to 0? I was thinking doing /scoreboard players reset @a, but that would cause them to not be on the scoreboard. I also can't do /scoreboard players remove because all players will have different scores. I can't test it because I only have 1 person which is me, but it seems to work. Thank you so much Skylinerw. This has helped me a lot. thanks a million! I have one more question... I have a testfor command running to detect the score at 0. If the players just joined the world, it would detect it and run that. I have a comparator for the output of the testfor command to run a bunch of stuff. How would I reset it so it's not powered if it's resetting everyone's scores to 0? Where should I put that command block in my set up? Exitrida where should I put it? Should I invert the signal?